My love for Joanna Vargas runs deep. Skin deep. When I first introduced readers to Vargas, the beauty guru schooled me on “beauty eating” and bad skincare habits and it wasn’t until after I wrote the story that I found out about her Miracle Bar. Too bad I didn’t get to probe her about my burning questions then. Instead I made myself a test dummy and found out the truth behind the rave product reviews. For years I’ve stayed away from “cleansing bars” which always leave skin feeling tight and squeaky clean (not in a good way). The Miracle Bar is unlike any bar soap on the market blending olive oil, shea butter, babyfoam, bamboo powder, charcoal, and lemon oil/sweet orange oil. 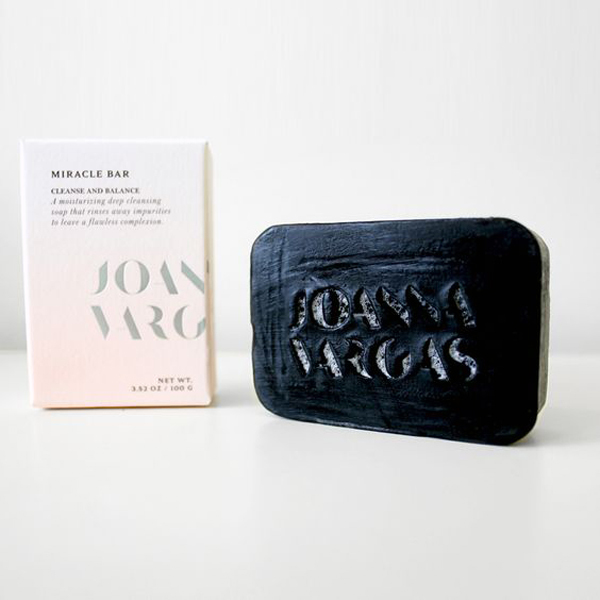 The soap contains activated charcoal, which holds 1000 times its weight in toxins, which means it draws out all the gunk and grime sitting on the skin’s surface and plugging your pores. If you have oily or acne-prone skin, you can use the soap daily but if your skin is normal to dry, trying using it 3-4x/week or when you need a deep cleanse. With a light citrus scent, the soap lathers easily, becoming frothy so it’s easy to spread across your face without harsh scrubbing or overuse of excess product. After rinsing, the soap leaves behind no residue and surprisingly moisturized (must be that olive oil!). Speaking of olive oil, the ingredient also has the added benefit of being an anti-inflammatory so those trouble spots appear less inflamed and red, providing a clearer more smooth complexion. Non-drying. Anti-inflammatory. And it pulls out the toxins! It really is a MIRACLE!